On October 17, 2013, farcical indie adventure The Stanley Parable was released on Steam. It features an achievement called “Go Outside,” which requires not playing the game for five years. Today is October 17, 2018. Achievement unlocked? There are ways around time-based achievements. For example, one could easily earn The Stanley Parable’s “Commitment” achievement, which requires playing the game for an entire Tuesday, by fiddling about with their computer’s clock. Likewise, unscrupulous or enterprising players, depending on your point of view, could earn “Go Outside” by convincing their computer it’s five years in the future. That would explain why 7.4 percent of players have achieved what was supposed to be unachievable until now. Not to be confused with the achievement named “unachievable”, which 4.4 percent of players have achieved. 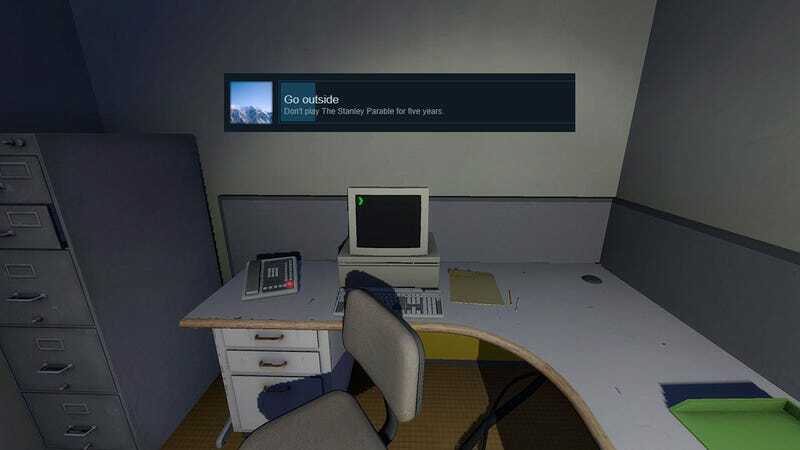 And should you, like our managing editor Riley MacLeod, not remember the last day you played The Stanley Parable and find yourself afraid to open the game and reset the timer, have a lovely day.